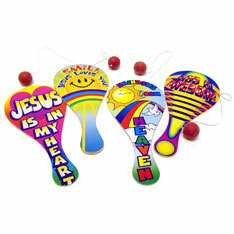 Colorful and fun wooden paddle ball game. These have Christian sayings on them and will brighten the mood of the gloomiest of spirits. Sold by the dozen. $3.60 per dozen for 48 dozen or more. $3.20 per dozen for 96 dozen or more.